We have acknowledged your email correspondence in this chamber and I want to believe that my late client, Dr Gary Jones had known that you will put the money to good use for the less privileged that is why he selected you and my contacting you was based on his recommendation. 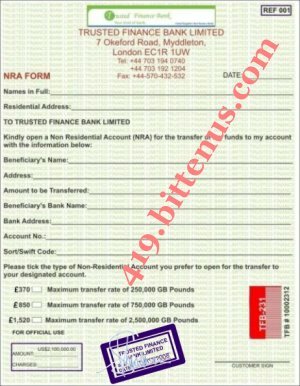 I have never met you before like I said and I am only doing my Job due to my late clients instruction to contact you and make sure you receive the funds which he bequeathed to you. I believe you must have known him a long time ago or probably you must have been nominated by a good friend of yours who wished you well. Be aware that we have all the necessary documents backing up the funds left to you by my late client and we hope the above informations be sent to us on time to proceed futher with the execution of the WILL and last Testament of Dr Gary Jones. Be aware also that from my years of experience in this field of proffession, I cannot send you any document until we are fully convinced that you are the true beneficiary. I await your early response. I want to inform you that I have crossed check your information you sent with my record and the informations are correct which make you the qualified owner of the funds which was bequeathed to you by my late client Dr Gary Jones. TRUSTED FINANCE BANK LIMITED of the wrong delivery. I want to inform you that I have been paid the legal fees to execute the WILL of my late client before his death so I will not request any money from you. I contacted the bank and they are only asking for an account opening fee which is refundable. The money you are paying to them will be added to your total funds of $2,100,000.00 when transferred to you. So please co-operate with the bank by following up their instruction so your bequest funds can be transferred to you. Be informed that all banks has their own regulations and their rules differ from one country to another. I am in the United Kingdom and I expect that when I give you my word, you should understand because I live here. You cannot expect your bank to make you follow their own procedures in our country. Your have to make the payment as instructed by the bank so they can open up an account for the transfer to your account. I assure you there is absolutely nothing to worry about as I can even provide you a letter of Guarantee which can be legally binding against me in the court of law. What ever payment you make, if any loss I will be held responsible for it. You just have to follow the banks procedures and your funds will be transferred to you.